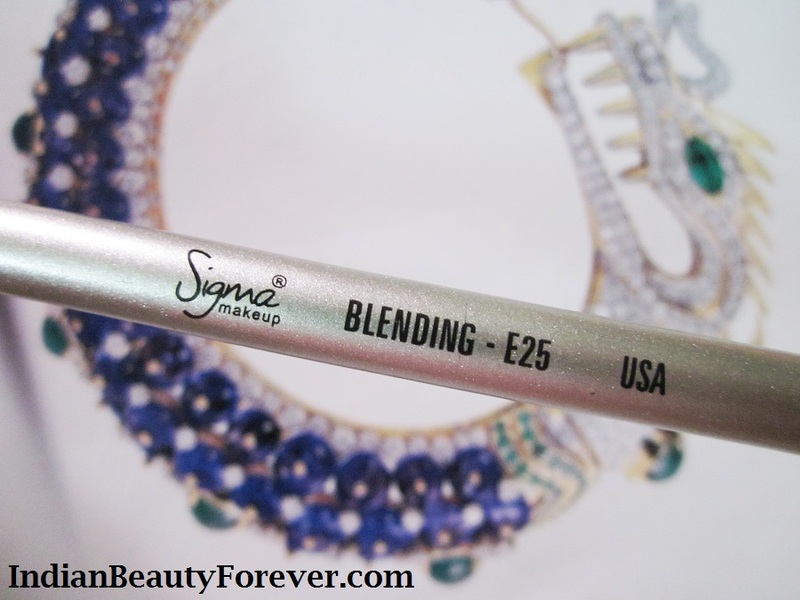 I will review this Sigma blending brush E25 today. If you are into eye makeup especially when it involves at least two colors, blending them and eliminating the harsh edges is really important and for this blending brushes are there to make your work easier! Actually, blending brushes have round base with fluffy bristles so that they can gently blend and are not harsh to fade your eye shadows that you had layered. I got this Sigma blending brush along with the sigma eye shadow in Grasp more than a month ago and have used it quite a lot of times and make them bath as a lot of times. So, its high time for the review! Price- This sigma blending brush costs $10 (around 600 INR exchange rate!!! Sigh.!!) Excluding the shipping, I think this one is a part of some travel kit as it was a sample. See HERE. This blending brush stands 4 inches tall, very cute to look at with a strong steel grey handle. Their E25 individual brush is about 6 inches tall. The bristles are made up of goat hair I guess and are very soft. I have washed it a lot of time as I mentioned earlier but still not even a single strand fall out.. yaay!! It may be a bit expensive with the shipping but still cheaper than the MAC blending brush and is an investment. If you like doing eye makeup or are trying out, then to blend the shadows is crucial and this brush makes blending the eye shadows a lot easier and flawless. You won’t feel any roughness on your skin since the bristles are extremely soft. Its short so can be easily carried in small pouches if you wish! Honestly there was no a single flaw, I could find in this product except for the fact that it can be a tad expensive but then again it is worth the money. so pretty nice review hope you check my new posts !!!!!!!!!!! It is really great when it comes to effortlessly blending without over doing it! It blends eyeshadows seamlessly.. love love love it!! Same here Poo! I love love love it too. :) it blends like magic and creates a nice smooth transition of colors. Sigma! Sigma! Sigma! This one is a must have! Nice review. I love Sigma Brushes....I have 3 face brushes from them & tehyre really of good quality! This one also seems to be doing so great..would love to give it a try :)Great Review Niesha! Nice review niesha..I am using MAC 217 for blending and quite happy with that.. Thank you Tej!! I have heard a lot about MAC 217 It's good. :) I am also thinking of trying these or the real techniques. 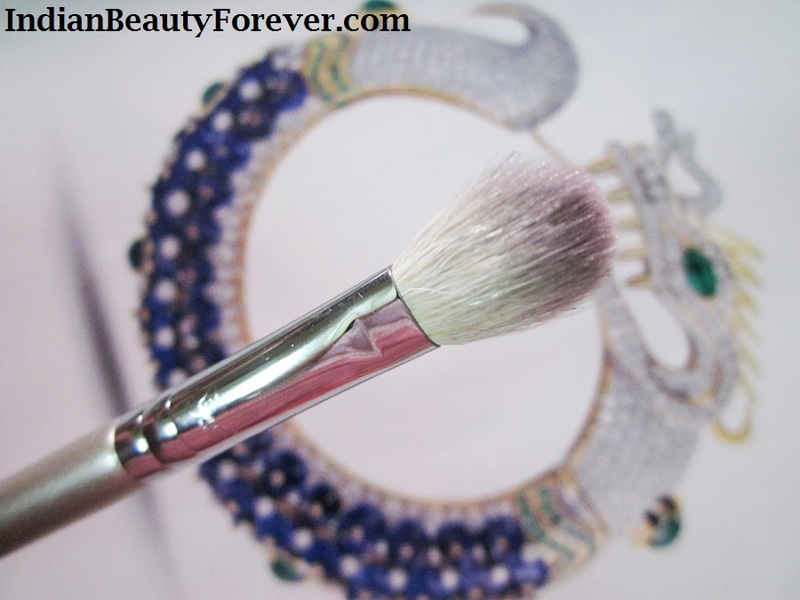 lovely review,.. i am not tht much into makeup but i know sigma brushes are so loved around.. Thank you Dimpal! They are really very popular amongst makeup lovers across the globe! Could not find any cons in this brush as it does what is is suppose to do. :) Thank you Meghu! I have so heard about this brush and I so want it!! How much did the shipping cost you Niesha? It was a PR product actually dear, I guess, I forgot to mention it at the end of the post. I think the shipping is 12 $ something. Wonderful review Niesha <3 ! I love TBS and mac for eye shadow brushes... but I'm now thinking of buying sigma face and eyeshadow brushes - any recommendation ? Thank you Anu! :) Colorbar and Faces brushes are good as well and also affordable. I have a couple of faces one. 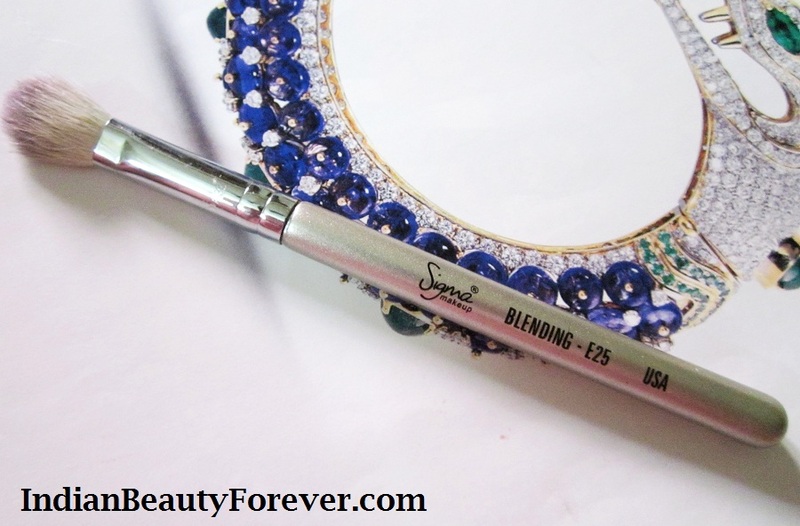 the blending brush is amazing more so coz of its short handle.. nice review Niesha!! Around How Much Does It Costs With Shipping Included? I think it is $12, as it was a sample but buying singles and paying shipping isn't a great deal. Get their kit instead.